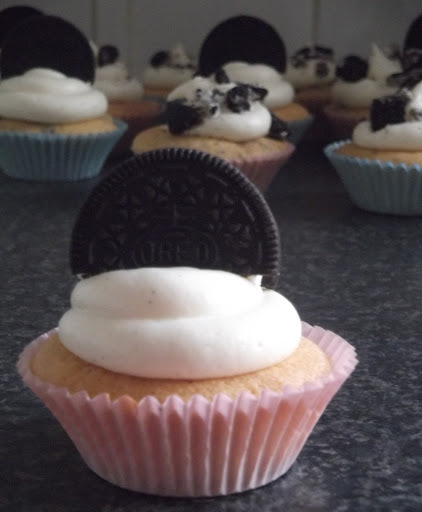 Uh oh I’ve jumped on the bandwagon again, given in, and made Oreo Cookie Cupcakes! I’m sure most of you in the baking blog world have seen Oreo cupcakes, Oreo whoopie pies, Oreo brownies, giant Oreos, Oreo celebration cakes, Oreo cake pops and much, much more! Now I love Oreos as much as the next person but I have to admit I rarely eat biscuits so they’re not a staple in my house. 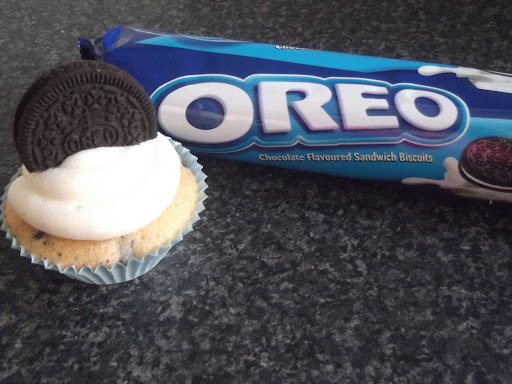 Nonetheless they were on offer in Tesco’s and I thought I’d take the humble Oreo to the next level and bake with it! So, if you’re a big Oreo fan, or if you’ve never had one before, I’m sure you’ll fall in love with both of my Oreo Cookie Cupcakes – the perfect balance of vanilla cream and bitter chocolate in sweet cakey form. Perhaps before giving you the recipes I should introduce you to the humble Oreo. Essentially it is two chocolate wafers (biscuits) separated by a cream filling. You can also get a chocolate cream filling. Believe it or not, the cookie has been around since 1912!!! And unsurprisingly is the best selling cookie in the US! They were first introduced to the UK in just 2008 and were originally only stocked in Sainsburys. If you’re lucky, you may find an Oreo Krushem or Oreo McFlurry in a KFC or McDonalds near you! In the meantime, you’ll just have to stick to making your own Oreo Cookie Cupcakes. Here are the recipes. There are two variations to this recipe. The first you can see from the photo above. You take one of the wafers off so that the crème filling is directly touching the cake batter. This makes for a deliciously sweet bottom to the cake but means that you have some biscuit bits left over. Also I chose to cut my Oreo’s off just below the word “Oreo” in the middle of the cookie before topping the cakes with them. I used all of these leftover bits for the second variation of the Oreo Cookie Cupcake recipe. Preheat your oven to gas mark 4. 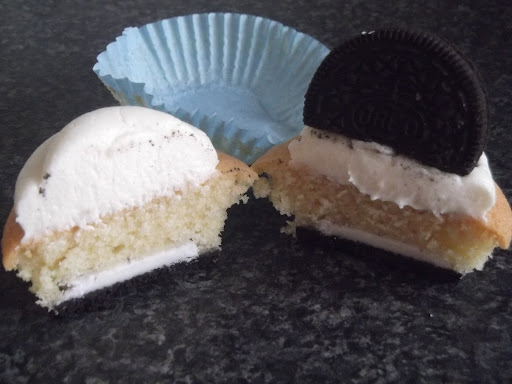 Twist off one side of the Oreo and place the other biscuit side into the cake case with the cream filling facing up. Place these to one side while you make the cake batter. Whisk together you butter and sugar until it has become much paler in colour and is very soft. Whisk your eggs and add slowly to the butter and sugar mix whisking vigorously until thoroughly combined. Next fold the flour into the batter in two parts. Finally spoon a large tablespoon of the mix over the Oreos in the cake cases. Place in the centre of your oven and bake for 15mins or until golden and springy. Decorate with the vanilla buttercream when completely cool. Preheat your oven to gas mark 4. Gather together any broken Oreo pieces and give a good bashing along with half a packet of whole Oreos until they form “chips”. Whisk together your butter and sugar until it has become much paler in colour and is very soft. Whisk your eggs and add slowly to the butter and sugar mix whisking vigorously until thoroughly combined. Next fold the flour into the batter in two parts. Then finally fold in the Oreo “chips”. Most people preferred the second of the two Oreo Cookie Cupcake recipes. Although the first recipe most definitely has the ‘wow’ or ‘novelty’ factor, everyone loves a chocolate chip cake and the biscuit pieces throughout the cake batter work really well! I’d definitely recommend you give this variation a try as well! As for decorating, I decided to do what I call “cloud icing” where you simply use a large circle nozzle and swirl it upwards giving a fluffy appearance. On some I chose to crumble more Oreo pieces rather than “dip” a whole Oreo into the butter cream, but of course you can decorate them as you wish! If you do use one of these decorating methods, the whole pack of Oreos should still be plenty! 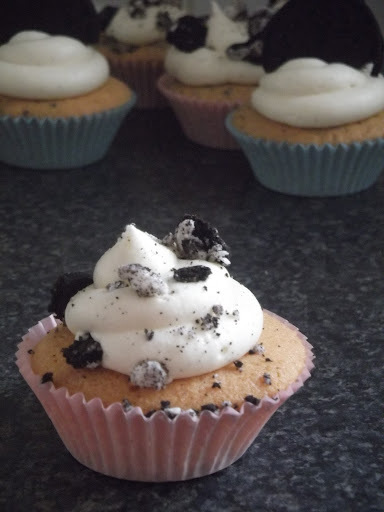 So there we go; two delicious takes on the Oreo Cookies and Cream Cupcake recipe!!! Luckily for me I have a whole pack of Oreo’s leftover as I didn’t need half as many as I’d bought! So I’ll have Oreo’s coming out of my ears for the next week or so! I've picked up a packet of Oreo's too as I have also jumped on the bandwagon to make similar cakes. Fab inspiration. I have to admit they're not my "go-to" biscuit…that would be a bourbon…or a custard cream haha! But these really are delicious!! !